Dies Irae: Day of Wrath presents, in fictional form, a realistic account of an attack by ISIS within the United States. The author based the work on prior terrorist actions in Russia, Syria and Iraq. He narrates a scenario that brings such tactics to America: an attack launched against five of our nation’s elementary and middle schools combined with deadly shooting “hits” along our interstate highways. The goal: to terrorize and shut down America. In 2004, a radical Islamic nationalist group struck a Russian school in the province of Chechnya. Over three hundred children and teachers were slaughtered. A year or so earlier, two gunmen, operating in the greater Washington, D.C. area, sowed panic when they launched random sniper attacks along major highways over a span of several months. Most recently, ISIS, during its offensive into northern Iraq, took this technique to its ultimate step and unleashed hit teams along highways into Mosul and Baghdad, gleefully recording and broadcasting the slaughter that they carried out. Four hijacked commercial jets, on September 11, 2001, produced three thousand deaths and a permanently changed America. What could one hundred terrorists, using a low tech approach, do to the national psyche if aimed at highways and, horrifyingly, suburban elementary and middle schools, killing thousands within a few hours? 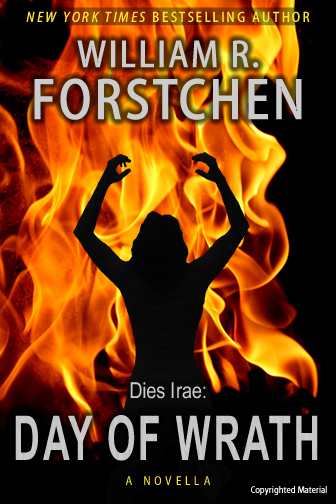 This is the dark scenario presented by Forstchen in his novella, Day of Wrath.